A few years ago, a good friend’s daughter was on her high school track team. They were a great group of dedicated and proud kids, that especially enjoyed wearing shirts to school that read “My sport is your sport’s punishment”. But being a still growing teen and running hard every day took a toll. Pain began to set in which eventually became unbearable. When the coach recognized the pain level increasing past normal aches into something more serious, he recommended the parents take her to a particular Orthopedic Surgeon. Why? At some point, the coach learned of the doctor’s passion and expertise with runner injuries, and from that grew a long lasting relationship. Many of the coach’s athletes have been helped by this physician over the years. After the visit, x-rays and so-on, the diagnosis was a stress fracture and she was done running for a while. The doctor referred them to a local physical therapy practice that, once again, passionately specialized in these such injuries, especially in teens. Furthermore, they were also referred to a provider of inserts for her shoes. The combination of these three providers’ expertise allowed their daughter to recover fairly quickly, rejoin the team and compete. And as a new college graduate, she still enjoys running for pleasure and has recently completed a marathon. In this story, the physician, physical therapist and orthotics provider were obviously happy working together with patients like this runner, which made the whole experience so much more comforting to her and her parents. So what does this have to do with MDreferralPRO, a company that provides a tool to allow practices to stay on top of referrals? First, remember that referral sources can come from anywhere and it is important to constantly hone all potential and active relationships. 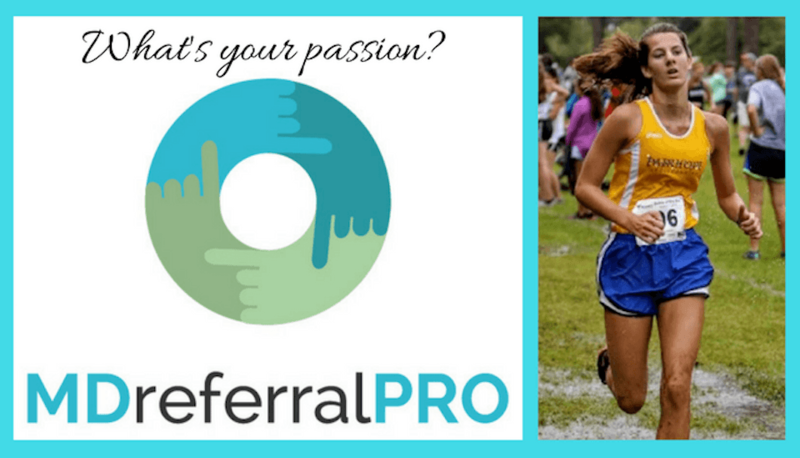 Second, we help our clients to find and focus on relationships and produce referrals that stem out from the passion, expertise and goals of their providers. What are your passions as a provider of medical services? We’d like to help you follow that passion.